Among the restaurants that earned stars in this year’s Michelin guide, there was one big surprise among the expected heavyweights. 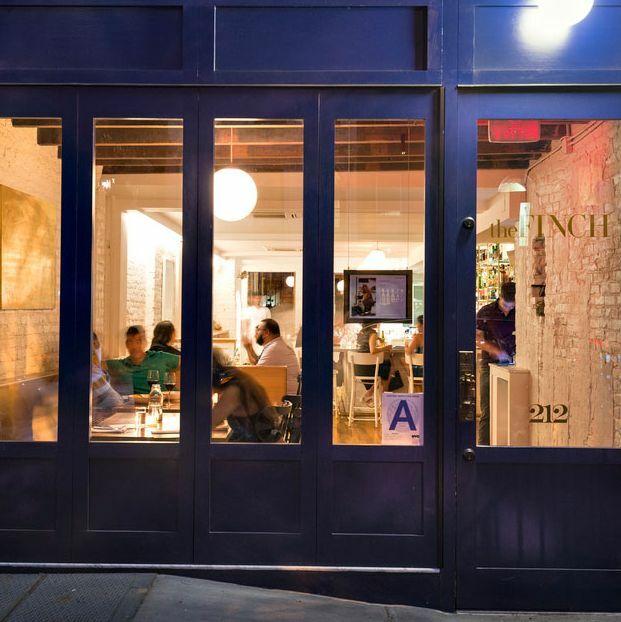 Gabe McMackin’s the Finch, a Clinton Hill restaurant that quietly opened ten months ago, was awarded a single star, a major get for the ambitious neighborhood spot that had so far flown pretty far under the radar. Of the restaurants that nabbed a single star, the Finch was one of just five that opened up in the last 12 months. The others — Gabriel Kreuther, Rebelle, Semilla, Tempura Matsui — were all highly anticipated openings that generated a lot of buzz. McMackin, a veteran of influential New York kitchens including Blue Hill at Stone Barns and Roberta’s, says he definitely did not see this one coming and spoke with Grub briefly on Wednesday (before heading to the Michelin party to celebrate) about what went through his mind when he heard the news and why he doesn’t want this to change his restaurant. Surprise. Really, I think what we are trying to do at the Finch is have a good time and make good food in a really beautiful space, and it’s amazing that what we do resonates with people. That people have a great time when they come in, if those people happen to be the reviewers or inspectors — whatever the proper word is — from Michelin, that’s amazing. If they choose to award and notice us, it’s a great pleasure. It’s hard to let it all kind of sink in still. It’s just kind of a neat thing to be aware of. Well, what was going through your head? A lot of stuff. It’s really just about What does it mean? and I hope I don’t cut myself, I’m still working on this cutting board, and I have to keep my head about me. You know, I have a 7-week-old son, so I am not getting the most sleep, and having this news has put me into a little bit more of a daze than I’m already in. It’s truly incredible to be able to have a brand-new restaurant under a year old, my first child, and this first star. I don’t know that I can say what I have been thinking because it’s all been scrambled together and kind of wonderful. So this wasn’t really something that you were gunning for when you opened? To be honest, no. We were just trying to make a great restaurant. I can’t say it was something that I was aspiring to, but for everybody in the world of food, everybody that makes cooking their way of life, it is an aspiration in some way. I’ve been in and out of kitchens for 20-some-odd years. The weight of a Michelin star is incredible, and to have one hanging around my neck is just not what I had expected. But is a really, really neat thing to think about. So you opened up about ten months ago, right? We opened up December 3, so pretty recently. That’s a relatively quick time to receive this recognition for a restaurant like the Finch. And it’s not like you guys made a big deal of your opening, and you’ve been doing your thing since without making a lot of noise. Yeah! I think a lot of people that are doing food take a long time to inhabit their space, and certainly we have time to get good at doing what we do here. We took 18 months to build this space out, and then when we opened everything changed and we’re still finding out more about who we are. We didn’t do any PR to tell anyone about what we were doing or why we were doing it. We were just doing it, and what energy we were able to spend went back into the system. Rather than trying to say, “We’re here! And we’re doing all this great stuff!” we just did great stuff. And I think that has resonated with guests. To make that the hallmark of our presentation, and the thing that people encounter as soon as they walk in, I guess that’s the goal I set for myself. Robert Sietsema called the Finch a bistro. I don’t know if that’s what you call it, but it’s a neighborhood place with an extensive menu and slightly more adventurous food. So having this Michelin star could make people trust you more, but I think the downside is that it can change the restaurant from what you originally wanted it to be. Well, yeah, it is. If we’re alienating our core customer, making that person that has been the bedrock of our business for the last ten months feel uncomfortable about coming in, that’s a huge challenge. The people who make this place special are the folks who come in on a Wednesday night and just want to do their thing. Maybe they want the same thing they had the week before and the week before that. Or maybe they want to try something new today. I feel like it’ll make it harder for that person on Wednesday, but we still want it to be exciting and welcoming for those folks that just want to have their chicken, bread and butter, and green salad. The sense of it being a neighborhood restaurant and a destination is appealing. I feel like we’ve been that way since the beginning, but we’re now there on a somewhat larger scale. There are other restaurants, like Gramercy Tavern, that do that incredibly well and have for a long time. So you don’t want this to change your restaurant? God, I hope not. I hope we get busier. But if we do tons and tons of business so that so many people come in and we lose sight of what we are about, then we move away from our mission. That is not what we are here for. If we have the confidence from our guests to explore what it is that we do at the restaurant and people come in with a little more knowledge or faith, then we can do more with our message. If people come in and think, I heard this place was great, let’s test it, and we’re in this battle with our guests, then we’re shooting far from the mark. Do you hope this will allow you to be more ambitious or adventurous with your food? I don’t think we are more or less adventurous in our focus. I think there are things that do or don’t make sense in a time or place. It’s not food that’s ambitious or cautious, it’s just food that makes sense in that time, at that place. I want to make sure that it’s exciting for everybody that comes in as well as the people who cook and serve here. But to say we want to make the food more ambitious? I always want to challenge ourselves, but I don’t think ambitious is really the right word. I want to make it more exciting always. But that’s been the goal since the beginning.